Last year around Christmas time, something very exciting happened: one of the videos on The Japans went viral. 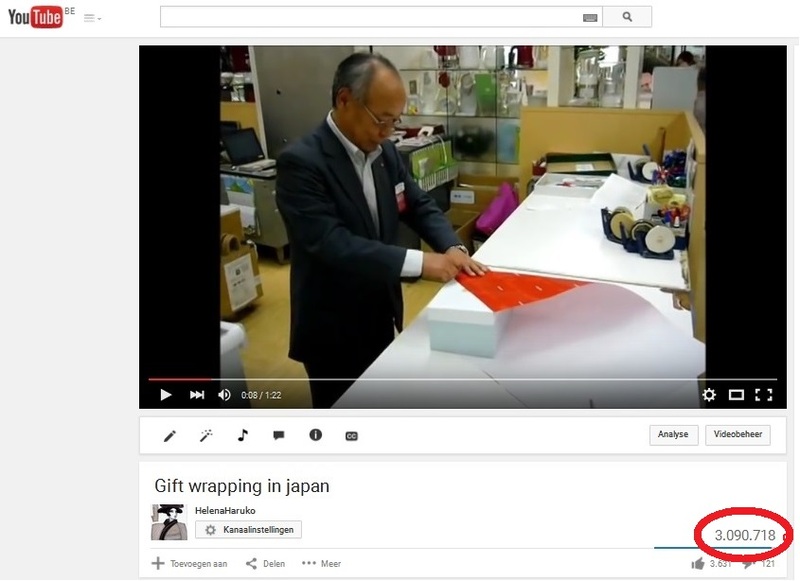 The video I am talking about is ‘gift wrapping in Japan’. It was a big surprise when the video went viral. The article on my blog ‘Japanese gift wrapping‘ had already been published since October 2013 so I was by no means expecting anything to happen with it anymore. If anything, the video I might expect to go viral was ‘moving fish head on a sashimi plate’. But the internet is an unpredictable thing and while ‘moving fish head’ currently has a mere 6000 views, ‘gift wrapping in Japan’ went viral. It all started when ‘gift wrapping in Japan’ was picked up by Digg around the holidays. They posted the video on their homepage and the link generated lots of traffic to my YouTube channel. In two days’ time, the video got over a million views. Currently the views have stabilized at about 3 million views. A link on Digg. Hurray! 3 million views, I can hardly believe it! It was a super exciting time. I never expected something like this to happen when I started this blog. It was really validating to reach such a wide audience and to see my content alive on the internet on such a large scale. But we all know that the viral phenomenon is short-lived and both the excitement and the large visitor numbers have died down since late January. Today, however, I felt a new rush of excitement when I saw ‘gift wrapping in Japan’ on 9GAG. Although there is no mention of The Japans and therefore no traffic to my blog, it is still really exciting to see my content pop up unexpectedly on the internet. I reminds me of how much I love blogging and how great it is to connect with people from all over the world through the internet. I think this is the perfect time to send out a big thank you to all my readers. No blog without an audience. Thank you! This entry was posted in Japan and tagged 9GAG, Blogging, Gift wrapping, video went viral, Viral video by Haruko-chan. Bookmark the permalink. congrats on getting more viewers for your video. I loved your post on Japanese style gift-wrapping so much that I’ve referenced it for the last two years when it’s time to wrap Christmas presents. It’s always frustrating to start as I have to relearn the folds, but it’s really satisfying to produce a gift that looks a little fancy even without bows. I’m so glad you love that post and use it for your own gift-wrapping! I agree it looks great. Then only downside is that it takes a bit more paper than the usual Western style.